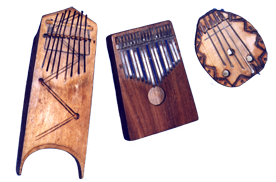 Happy percussive music from the Eastern side of Africa where influnces are many - Arabian, indian and of course Bantu. Types range from traditional tribal to Afro-pop. Chill Acoustic guitars and groovy beats. Starts out fairly cool, then goes into a bouncing and happy Afro-Caribbean groove. Also has some chanting / singing in a made up language with no meaning.